Male models from the trending fashion label “Venal as F*ck” show the new season’s range of identical grey jackets. 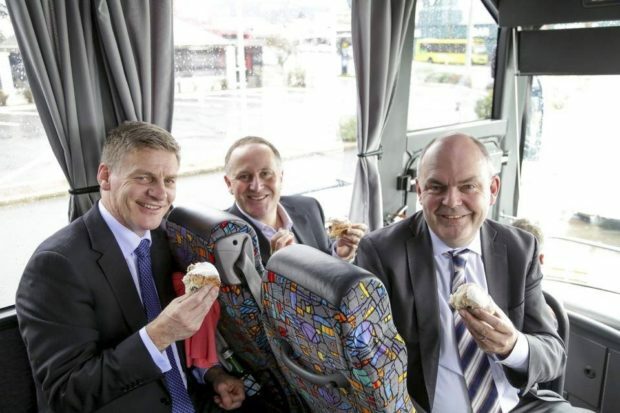 Three doughnuts. Oh and some baked goods too. Spot the banker……taking with both hands! As someone said ‘Let them eat cake’ and that’s okay with me – I consider I’m the most deserving, with lots of cream on top thanks. Look we’re just ordinary folks enjoying a bit of creamy bun and soon a pie and cup of tea – just jolly good folks like you. And here are the three leading players in the team touring New Zealand demonstrating their skills at the sport of hoopla. A less seemly trio could hardly be gathered together anywhere for the purpose of not having something unseemly said about them. –Can Bill have a spaghetti and pineapple one? It all seems so long ago and far away…that we/they thought they mattered. Who chose the material for the bus seats? Max did. Shut up and smile for the camera we’ve gotta shift these muffins Stephie made. Oh, sorry, Simon, they’re all gone now. How about some crumbs? Used up our 20M of free WiFi, let’s eat. Cheers business in nz no.1. The baby[ies] on the bus go, “wah, wah, wah! Bringing cream buns for baby Neve. three huckstereers, Amanass, Atoss(er) and Poortos(ser). On our way to the Annual Undertakers Conference themed “Balming a Brighter Future”. So, now we’ve got the icing off everyone’s cake, what’s next, fellas? we may have kept our places. The bus boys at smoko time.